A charm pinpoints the place of your choosing with hand-stamped geographic coordinates. Picture for a moment that perfect place—your childhood home, a summertime retreat, or some dreamlike spot you may never see again but cannot forget. Now, imagine being able to carry that place with you always. Ana Talukder's uses a wax seal to create the organically shaped charm for this piece, which is crafted from recycled sterling silver and pinpoints the place of your choosing with hand-stamped geographic coordinates. Comes with silver polishing cloth. Handmade in Seattle, Washington. Don't know the coordinates? No problem! Just let us know the address/location of your special place and we'll take care of the rest. Make it a set! Click here to see the matching Latitude Longitude Custom Rings- Set of 2 and Latitude Longitude Pendant. I am very disappointed with this bracelet. There were no reviews, so I bought the bracelet based on the description, pictures, and the materials from which it was made. This bracelet is marketed as being sterling silver, however it is NOT! This was a gift for my mother who is highly allergic to nickel. She breaks out in terrible rashes if nickel touches her skin. This bracelet ate through her wrist after the second day! The bracelet is much too expensive to not be sterling silver. 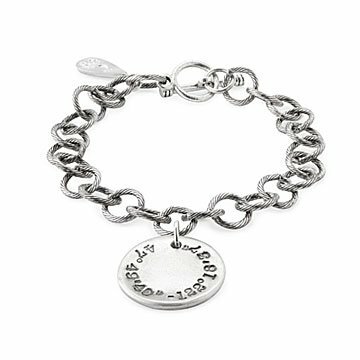 I will admit that it is a beautiful bracelet, however, it should not be marketed as sterling silver if it is mixed with nickel. I understand that there is also resin and sand listed in the description, however, my mother has no allergies to either. If nickel was listed as one of the materials, I would never have bought it. This is false advertisement and I want a refund. I feel terrible for my mother not only because this was a birthday gift for her, but also because she will have scars from the rash that is currently on her wrist! DO NOT purchase this bracelet if you or the recipient has even the slightest allergy to nickel.